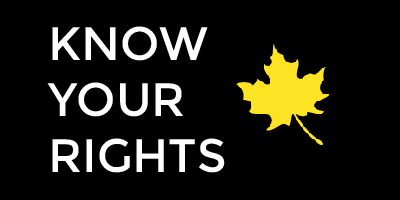 This Know Your Rights guide is the second in a series aimed at helping you understand your legal rights to free expression and privacy. The Know Your Rights series is partially funded by IFEX and is part of PEN Canada’s Canadian Issues program. Download this wallpaper for your phone so you can refer to your rights on the go. Need help making the image your wallpaper? Click here. 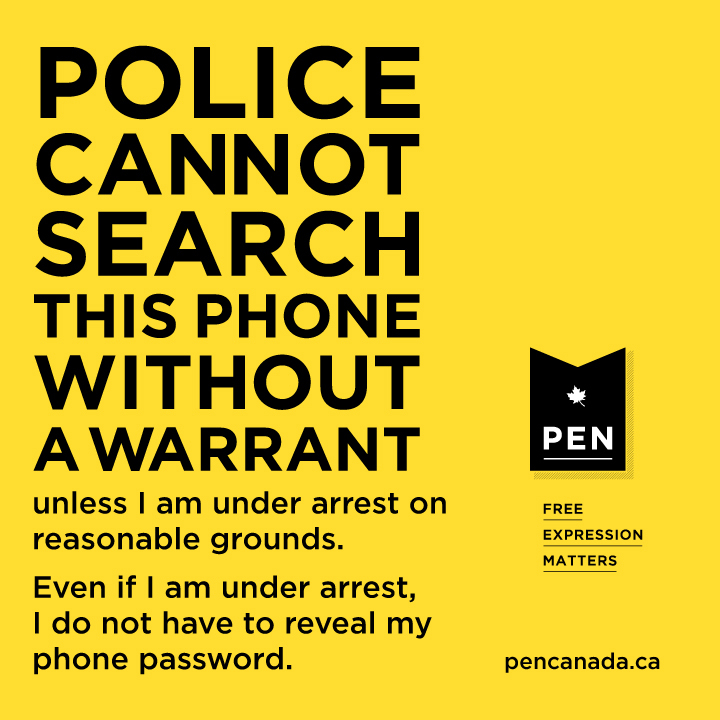 A December 2014 decision by the Supreme Court of Canada allows the police to search some information in cell phones without a warrant when making an arrest. This controversial ruling is the first to consider cell phones as part of a search relating to an arrest. It recognizes that unlike most other objects, mobile phones require special consideration because they are stores of private information. Bill Kowalski, chair of PEN Canada’s Canadian Issues Committee, has written an op-ed warning of the potential dangers of this ruling. 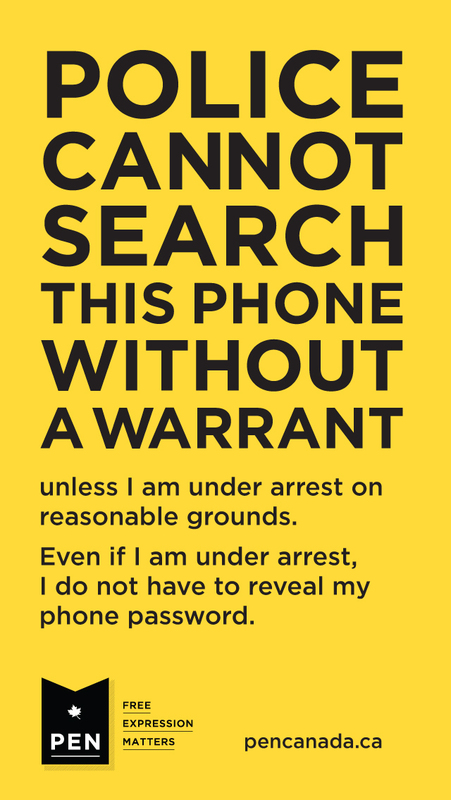 This guide is intended to help you understand your rights if you are asked to show your phone to the police. It is not legal advice. 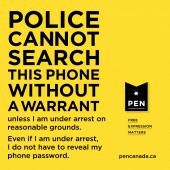 Under what circumstances can the police search my phone without a warrant? Generally, there are only specific circumstances in which police are authorized to conduct a search without a warrant, one of which is during an arrest. This power is intended to allow police to ensure safety and to collect evidence related to the arrest. The police must have a legal reason for your arrest. This means that you have committed a criminal act or that the police have reasonable grounds that you have committed a criminal act. The police must conduct this search promptly upon arrest. The police also must have a “reasonable basis” for searching your phone that is relevant to your arrest. To be valid, these reasons must fall under one of three areas: a) protecting the safety of the police, accused, or the public; b) preservation of evidence; c) discovery of evidence related to the suspected crime. This could be locating additional suspects, or searching out information that the police need immediately to conduct their investigation. The police must tailor the search of your phone to the information that they are looking for. The police must take detailed notes of what they searched and what was found. The police cannot engage in routine browsing through your cell phone. If you are not under arrest and an officer without a warrant asks to see information on your cell phone you may say no. Can the police access everything on my phone? Police are only allowed to access content that is related to the purpose of the search. They do not have the right to access all content on your phone without limits. For example, they may be able to search for communications that took place within a reasonable time frame related to the alleged offence and not all your phone history. Of course, due to the nature of cell phone interfaces, it is possible police could access unrelated content in the course of a lawful search. How are the police being held accountable for following the search rules? This new ruling creates a procedure to help keep police accountable to the search regulations. They must keep a careful record of what is searched, which will generally include the applications searched, the extent of the search, the time of the search, its purpose and its duration. Be aware that these records are only reviewed after the search, so the content that is accessed at the time of the search is left to the judgement of each individual officer. It would be difficult to prove what content was or was not accessed after the fact. What are the concerns about cell phone searches after this new ruling? There have been concerns over the potential police abuse of their new power to search cell phones without a warrant, especially their ability to access content not related to the crime, and their ability to delete evidence. Can the police search my phone if it is password protected? Am I obligated to give them the password? No, you do not have to give police your password due to your “right to remain silent.” However, police are permitted to use other means to unlock your phone, for example through forensic methods or by trying various passwords. They may also be able to seize your phone, but in that case, the Supreme Court’s decision is unclear as to whether a warrant would have to be obtained at that point in order to conduct a search of your phone. If police search my phone can they delete photos or recordings? No. In keeping with your rights generally and your rights as a photographer, police are not allowed to delete photos or recordings. If police ask to search my car/house/bag and I agree, does that mean I have given permission for them to search my phone too? This depends on the facts of each situation, however, in some cases, giving the police permission to search your car, house or bag, could mean that you are also giving permission for them to search your phone. 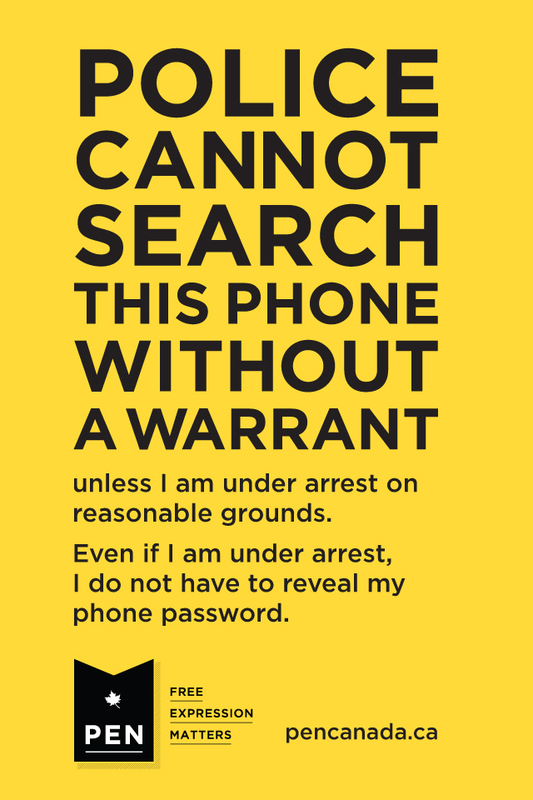 To be safe, if you are not under arrest, always be clear if you do not want the police to search your phone as part of a broader search. What are my privacy rights at the border? Recently a man was charged for refusing to give his phone password to a Canadian Border Services Agent (CBSA). Canadian Border Services Agents are different from police officers, so the advice in this guide does not apply to them. While the Charter of Rights and Freedoms still applies to border searches, the courts have held that we have a lower expectation of privacy at the border. The scope of our privacy rights in cell phones has not yet been tested in court in a border-search context.